We have news from the principality that the introduction of gold Machin Horizon labels to Wales was delayed by a week. The image shown, courtesy of Brian on the PostagelabelsUK blog shows usage at the Senghenydd PO near Caerphilly. 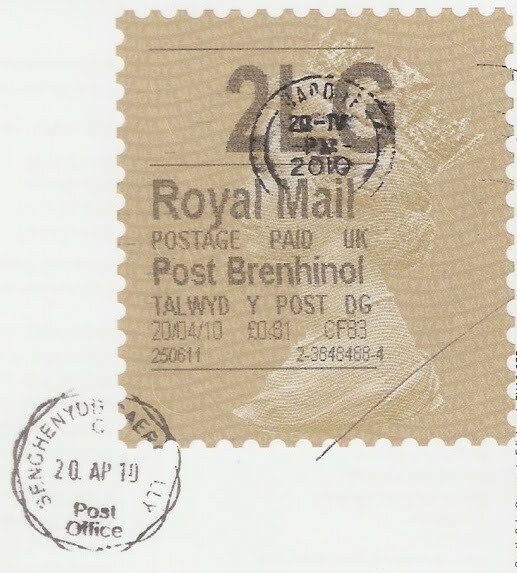 The office CDS has been applied, as well as the Cardiff machine postmark for 20-IV-2010. Brian has reported that some of the gold labels were mistakenly sent to POs in Kent. Some may have been used before instructions were sent to withdraw them, so keep your eyes open! 'Kent' referred to above turned out to be two branches in Orpington. Bassett Avenue sub-PO in Bicester (branch 170137) also has them (before 8 May), as well as one in Norwich (before 14 May) and one in Stockton-on-Tees (posted 12 May). 20 May update: reported posted from Horsham, Surrey. Also one from Sauchiehall Street, Glasgow G2 dated 12 May. Branch 362832. I have a large gold head from Stockton on Tees posted on 12/05/10 TS18 267327 1-3685717-1 should this not have been issued from there ? Thanks for writing. It appears that the supplies of white labels at the Swindon Supplies Depot was much lower than we appreciated, and that gold labels are now being distributed nationwide. We have reports of one sub-PO in Norwich using them. Reports now from north of the border and over the sea as Glasgow and Northern Ireland join the club. Details in the main body of the blogpost. 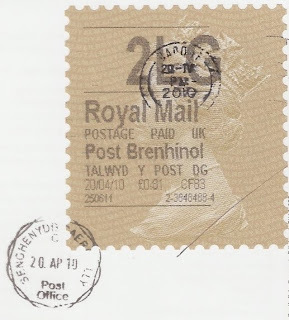 i bought a special delivery gold machin postage label from a large dealer from bulk mail and it was from OX area dated 12 May 2010-this was the ONLY gold machin Horizon postage label that he had from his bulk mail.!! !